It’s normal to have problems with your Michigan hot water heater every so often. Sometimes the issue is minor and there’s an easy fix for it, like when your pilot light goes out. But when the problem is more serious, it may be time for a new water heater. What if you can’t tell whether or not you need a replacement or new heater installation in the Detroit area? Why not call Andy’s Statewide and let a southeast Michigan leading installation team take a look at your water heater for you? The team at Andy’s Statewide can give you a free consultation and install your water heater in Detroit, Ann Arbor, Troy, MI and the surrounding areas, while sticking to your schedule. Our expert technicians can even help you with selecting your unit, so that you can get the water heater unit that’s right for your Detroit, Ann Arbor or Troy, MI home. Easy payment options are even available for those who qualify. Once your water heater is up and running, Andy’s Statewide is always within reach. We provide service and water heater repair for any system we install. This covers most makes and models including: gas water heaters, electric water heaters, and high-efficiency tankless water heaters. With any luck, you won’t need to have a hot water heater installed any time soon. But if for some reason you do, there’s no reason to worry about it. 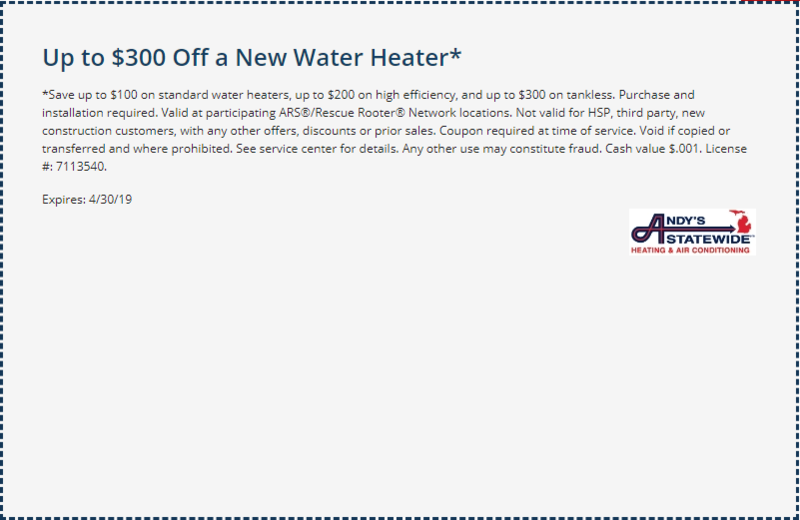 Andy’s Statewide is always just a phone call away for water heater installation service in South East Michigan.